Ideal for a wide range of indoor and outdoor applications. Produce displays with brilliant color and high-quality images. This sturdy film is ideal for a wide range of indoor and outdoor applications. 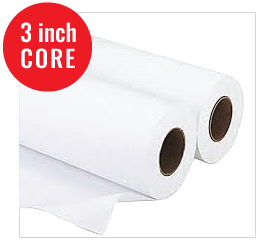 HP 4 Mil Double Matte Film(4 mil, 152 gsm - 3 inch core) The matte print surface is engineered so your prints dry quickly and resist smudging and smearing. This dynamic matte surface prevents lines from bleeding and promotes strong ink adhesion. HP 5.7 Matte Polypropylene(5.7 mil, 100 gsm - 3 inch core) When you are work calls for outstanding image quality for your day-to-day production, choose this versatile self-adhesive polypropylene film.